Oops, at this point I’d ran out of moulding sand. I briefly considered trying to pour the mould like this, but then decided that it would be much easier if the sand was level with the top of the box. So, I had to mix up some more moulding sand. You can see the little holes I made (with a bit of brazing rod which I had lying around) to vent the mould. When you pour in the metal, the air in the mould (and steam from the damp sand) needs to escape somewhere. Having these little vents helps the gas to escape. You can also probably make out the gouges which I’ve made in the inside walls of the cope. 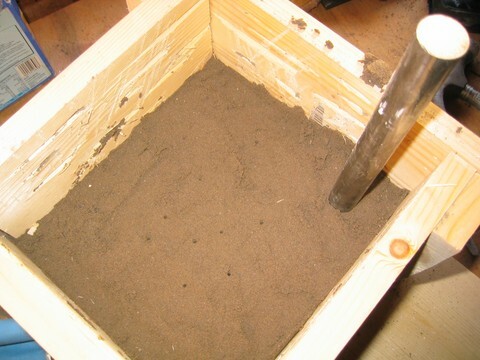 The inside walls should be nice and rough so that the packed sand has something to grip on. Otherwise, the block of sand will bodily slip down out of the flask. I just used a chisel to remove some chunks of wood, and it worked fine.